Since Lord Howe’s authority was, by design, extremely limited, the Congressional delegation was pessimistic about the meeting’s outcome. The conference, held in the days after the British capture of Long Island, lasted just three hours and was a failure. The Americans insisted on recognition of their recently declared independence, and Howe’s limited authority was inadequate to deal with that development. After the conference, the British continued their military campaign for control of New York City. When British authorities were planning how to deal with their rebellious North American colonies in late 1775 and early 1776, they decided to send a large military expedition to occupy New York City. Two brothers, Admiral Lord Richard Howe and General William Howe, were given command of the naval and land aspects of the operation respectively. Since they believed it might still be possible to end the dispute without further violence, the Howe brothers insisted on being granted diplomatic powers in addition to their military roles. Admiral Howe had previously discussed colonial grievances informally with Benjamin Franklin in 1774 and 1775, without resolution. General Howe believed that the problem of colonial taxation could be resolved while retaining the supremacy of Parliament. At first King George III reluctantly agreed to grant the Howes limited powers, but Lord George Germain took a harder line, and insisted that the Howes not be given any powers that might be seen as giving in to the colonial demands for relief from taxation without representation or the so-called Intolerable Acts. As a consequence, the Howes were only granted the ability to issue pardons and amnesties, but not to make any substantive concessions. The Commission was, however mandated to seek the re-establishment of the pre-war colonial assemblies, to offer again the terms of Lord North’s Conciliatory Proposal regarding self-taxation, and to promise a further discussion of colonial grievances. After the fleet arrived in July 1776, Admiral Howe made several attempts to open communications with Continental Army General George Washington. Two attempts to deliver letters to Washington were rebuffed because Howe refused to recognize Washington’s title. Washington did however agree to meet in person with one of Howe’s adjutants, Colonel James Patterson. 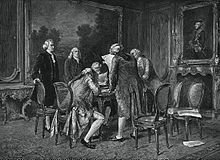 In the meeting on July 20, Washington learned that the Howes’ diplomatic powers were essentially limited to the granting of pardons, to which he responded that the Americans had not committed any faults and thus did not need pardons. Lord Howe then sent a letter to Benjamin Franklin detailing a proposal for a truce and offers of pardons. After Franklin read the letter in Congress on July 30, he wrote back to the admiral that “Directing pardons to be offered to the colonies, who are the very parties injured, […] can have no other effect than that of increasing our resentments. It is impossible we should think of submission to a government that has with the most wanton barbarity and cruelty burnt our defenseless town, […] excited the savages to massacre our peaceful farmers, and our slaves to murder their masters, and is even now bringing foreign mercenaries to deluge our settlements with blood.” He also pointed out to the admiral that “you once gave me expectations that reconciliation might take place.” Howe was apparently somewhat taken aback by Franklin’s forceful response. In the Battle of Long Island on August 27, 1776, British forces successfully occupied western Long Island (modern Brooklyn), compelling Washington to withdraw his army to Manhattan. General Howe then paused to consolidate his gains, and the brothers decided to make a diplomatic overture. During the battle they had captured several high-ranking Continental Army officers, including Major General John Sullivan. The Howes managed to convince Sullivan that a conference with members of the Continental Congress might yield fruit, and released him on parole to deliver a message to the Congress in Philadelphia, proposing an informal meeting to discuss ending the armed conflict between Britain and its rebellious colonies. After Sullivan’s speech to Congress, John Adams cynically commented on this diplomatic attempt, calling Sullivan a “decoy-duck” and accusing the British of sending Sullivan “to seduce us into a renunciation of our independence”; others noted that it appeared to be an attempt to blame Congress for prolonging the war. The Congress did however agree to send three of its members – Adams, Benjamin Franklin and Edward Rutledge – to a conference with Lord Howe. They were instructed “to ask a few Questions and take [Howe’s] Answers”, but had no further authority. When Howe learned of the committee’s limited authority, he briefly considered calling the meeting off, but decided to proceed after discussion with his brother. None of the commissioners believed the conference would amount to anything. Lord Howe initially sought to meet with the men as private citizens, since British policy did not recognize the Congress as a legitimate authority. In order that the conference might take place, he agreed to the American demand that they be recognized as official representatives of the Congress. The house of Christopher Billop on Staten Island was selected to be the meeting place. It had been occupied by British troops for use as a barracks and was in filthy condition, but one room was cleaned and prepared for the meeting. The arrangements included one British officer to be left on the American side as a hostage during the meeting; the Congressional delegation, rather than leaving him behind the American lines, invited him to accompany them. On arrival, the delegation was escorted past a line of Hessian soldiers and into the house, where, according to Adams, a repast of claret, ham, mutton, and tongue was served. The meeting lasted three hours, and the two sides were unable to find any common ground. The Americans insisted that any negotiations required British recognition of their recently declared independence. Lord Howe stated he did not have the authority to meet that demand. When asked by Edward Rutledge whether he had the authority to repeal the Prohibitory Act (which authorized a naval blockade of the colonies) as had been claimed by Sullivan, Howe demurred, claiming Sullivan was mistaken. Howe’s authority included the ability to suspend its execution, provided the colonies agreed to make fixed contributions instead of the taxes Parliament had levied on them. None of this could be done unless the colonies first agreed to end hostilities. 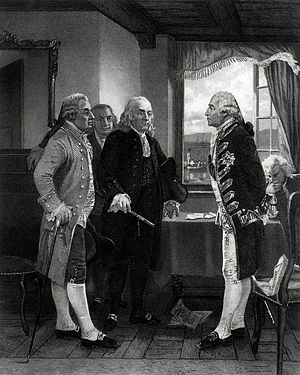 The Commission was empowered by the Crown to offer the rebel Americans pardons (with some exceptions), to allow judges to serve on condition of good behaviour, and to promise to discuss colonial grievances (except the Quebec Act) in exchange for a cease-fire, the dissolution of the Continental Congress, the re-convening of the legitimate colonial assemblies, the acceptance of Lord North’s Conciliatory Proposal and compensation for the Loyalists adversely affected by the war. The Congressmen returned to Philadelphia and reported that Lord Howe “has no propositions to make us” and that “America is to expect nothing but total unconditional submission.” John Adams learned many years later that his name was on a list of people specifically excluded from any pardon offers the Howes might make. Congress published the committee’s report without comment. Because Lord Howe did not also publish an account of the meeting, the meeting’s outcome was perceived by many as a sign of British weakness; however, many Loyalists and some British observers suspected the Congressional report misrepresented the meeting. One British commentator wrote of the meeting, “They met, they talked, they parted. And now nothing remains but to fight it out.” Lord Howe reported the failure of the conference to his brother, and they then made preparations to continue the campaign for New York City. Four days after the conference, British troops landed on Manhattan and occupied New York City. The house where the conference took place is now preserved as a museum within Conference House Park, a city park. It is a National Historic Landmark, and is listed on the National Register of Historic Places.